From start to finish, our high quality control procedures ensure each part will be exactly the same throughout the entire job, with a tolerance as close as .00005". Our unequivocal services are utilized in the manufacturing of molds, dies, gages, precision machine parts and components for the aerospace industry. 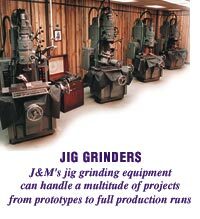 Our veteran staff is committed to providing the best quality jig grinding every time. At J&M we strive to meet all our customers' production needsour impeccable turnaround track record will impress you. Your production schedule dictates our delivery schedule.